My Grandmother is on twitter. Not in the conventional sense.. kicking back with a Macbook Pro, tweetdeck running on a separate screen. No, my Nonna only really geeks out on her sewing machine. It’s the only tech she can really operate with confidence. With everything else it’s “Computer says no..” She can’t really operate the home phone if she has to use more than one button. Yet through me.. whenever I’m visiting and occasionally over the phone, She tweets. Why not I thought. She is always saying what she thinks and I wish people were sometimes there to hear it. Then there are the times She gives me tidbits of her past that I’m desperate to remember but never write down. Twitter would be perfect for these times.. Not only to live blog her thoughts and past when I’m visiting, but also to give her that window to the world. She is now answering questions and asking me about the people behind the avatars. She doesn’t know what an avatar is, and I know the technology baffles her. It just makes me happy that as She is engaged in this new adventure, she forgets she is an 85 year old lady living alone, waiting to die. When she lost her daughter, my Mother, last year I noticed a rapid decline in her will to do anything. She blamed herself, God, anything for the hand she felt she was dealt, forgetting all that was good about her life, her family. She started to give up. Occasionally this now changes. When her failing mind reminds her, she will still ask me if ‘those people on the computer’ have asked her any questions. I get my laptop out and we sit there going through her replies. She is now even keeping her answers short and concise watching me as I type them in.. Aware that 140 characters is not long enough for a life story. Especially a life as crazy as hers has been. And she forgets all she is sad about. It’s as if I have suddenly invited a hundred people into her home and she is momentarily worried she does not have enough biscuits to go round. One moment she is lost in a YouTube video showing her a place she has not seen for 60 years.. The next I’m explaining why these people she has never met are so interested in her life. And she smiles. Twitter is becoming a micro diary of facts and figures, memories and moments in a woman’s life that I have known all of mine. Yet much of what she is talking about I have never heard. My Granddad was the story teller. My Nonna his obedient wife, helper and eventually nurse. Now it’s her stories.. and they tell me of a strong independent lady who has experienced far more than I could ever have imagined. She may not update regularly, but when she does, her straining short term memory takes a break as we smile our way through tales of times gone by, adventures and a childhood still fresh in her mind. These are my favorite times with my Grandmother. Thank You to all those who have engaged with her. you make an Old lady, and her grandson, very happy. My mums on twitter, and it’s a similar thing, only she’s tech savvy. I love getting to find out what she’s up to on a moment by moment basis. She now tweets pretty much her whole life, and has a whole load of people she chats to on there, some of whom I know nothing about, many of whom are my friends. It’s magical, it’s real and it’s got nothing to do with nerds and venture capital and recessions and APIs and 3,0 discussions or anything else. It’s just technology enabling connection without proximity. You are so lucky to have a gran who’s willing to share her stories and be open to talking to strangers asking questions about her life. Not just that, you are lucky to have a gran. Period. And she is ever so lucky to have you, Christian. Great post. I and my friends/family enjoyed your gran’s comments during the Obama inauguration. I think this a wonderful idea and a lovely thing for you to do. I have recently begun the slow process of scanning all the photographs from my grandparents house, which were shoved up into the loft when they passed.I look at all the ones of when they were young and wish they were here to tell me all about. Maybe gran can twitter embarrassing baby photos of you? I love that your gran is obviously curious and enjoying something most likely because she sees how much joy it brings you. It reminds me of my own grandmother asking me about music she knew I liked, I was amazed she’d even heard of these bands, but she obviously was making an effort because she wanted to know me better. Please pass on a big hello to her from New Jersey! Christian, this isn’t for you, it’s for Gran! HEY GRAN! I talked to you on video once! I just followed you on Twitter, I’m @PurpleCar. I hope you have fun! I’m a sewing person too. I also knit. What projects are you working on? Christian, this is fabulous. I will follow your Gran too of course. Tell her so, we had “spoken” on Seesmic for her birthday, I know she doesn’t need to remember, but *I* do. My mom is not wanting to approach the computer but fortunately my dad does it for her, so they can follow what I do online, and I am with you with the urgent desire to preserve life stories that otherwise may go lost, when there is no one to tell them. It is so important in my eyes. I wish they were blogging or post to Flickr, but fortunately my mom still has the energy to prepare scrapbooks of photos the old way, with her comments on them. It is fascinating, and I love reading those books of memories through her eyes! I believe History is not made by scholars, but by the people who can actually witness and retell what they experienced. I’d like you to know that I have tears standing in my eyeballs right now. What an excellent post, beautiful. I will be following your gran, and looking forward to hearing what she has to say. Cheers to you, bro. 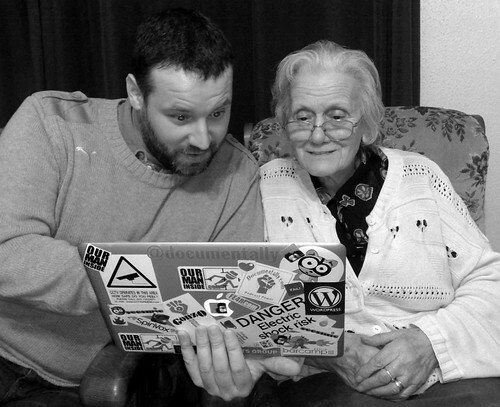 I think it’s awesome that your Gran is on twitter, even if she has to tweet through you. You should get sponsor to get her a macbook and someone to teach her how to do it all on her own. I’m willing to be she has a whole lot to say. Christian – I have a memory from early Seesmic days, when you were once visiting your Gran – and it was one of the first times you introduced her to many of us – I remember her amazement that you knew all these people, from all around the world, many people you had never met, just through the computer. I remember her saying – Who Are These People? Why Do You Know Them? She was as curious about us as she was amazed at all of this. I’m not surprised that she is engaged in Twitter. I wish I could sit down at her table, have a cup of tea with her. In lieu of that, thank goodness we get to knew her through you and through Twitter. Such a lovely lovely post Christian. Thanks for sharing this, it was really beautiful. Really beautiful and moving post, thanks! I’ll go follow your gran and be one more of those people in the computer! I think she is going to have a lot of messages on Twitter after this. Lovely post from truly a delightful person on Twitter. A beautiful idea wonderfully executed. as i read this it took me back to my nan and her little dog. the nuances of her actions – the shouting up the stairs when i spotted my grandad smoking out of the bathroom window in secret while i was running around the garden looking up amazed at the railway lines like a hidden city was beyond it. The fabric of ones mentality are held together with the glue of memories once told and people now passed. You dude, are constantly honouring those moments with your actions – you make your mother proud. everyday. and we love you for it. much love. phil. When I grow up I wanna be like your Nonna. Christian, you’re so very lucky to have this opportunity to connect so closely with your Gran, and let her share her memories with so many people. Your family circumstances match mine so closely (although some 30 years later) – my Mum passed away before both of her parents, and after my Grandad died a year or so later, the spark went completely out of Gran’s life. She slipped away soon after, and took her memories with her. Cherish these moments, record them to remind yourself and the world what a wonderful and rich life your Gran has had and is still to have. It is lovely to see that you and your gran are so close; you are a great grandson for sure, and I love reading your grans tweets. I love twitter as I get to have a peak at other peoples lives, in as much as they want to share. Say hi to your gran from me, and if she ever wants some baked goodies let me know! It’s wonderful to get to know your Gran – our Grans are precious people. @Granumentally thanks so much for sharing your pizza recipe! I’m going to tell my Granma Kay about you. What else can I write that hasnt been written about this post? As younger adults, we tend to forget that old people were young at some point and that they lived through similar joys and heartaches. When we look at old persons, we normally dont see individuals; we only see frail bodies moving slowly and anonymously in the margins of society, like shadows of their former selves. Thats a mistake: their body may be weak, but their mind is strong and their memories alive. They have so much to tell us if only we would take time to ask questions and listen. Youre setting an example for us all. Youre making us realize that technology does not have to be a barrier between generations; that it can be used to stimulate dialogue and built intergenerational bridges. Through you and your use of technology, your Nonna stops being an old lady and becomes alive as an individual: a strong-willed and warm woman, a fighter, a survivor. And the result is sheer magic. You have just earned another fan. So amazing, Christian. Really fantastic! This is just such a wonderful use of social media! I’m yet another person who is sitting here with tears in my eyes as I write this! I never really knew my grandparents, and my parents died when my children were very young so they haven’t known their grandparents. You are so lucky to have your gran, and she you. I look forward to hearing much more from and about her. how can anyone NOT love your nonna? she’s wonderful! thanks for unselfishly sharing her with the world. we’re blessed to “know” her. please post more vids – of anything and everything. a nonna virtual cookbook would be amazing! So pleased to read about your Nonna. I’ve also read all her tweets back to the beginning and I’m following her now. Long may she tweet! started reading with goosebumps. finished reading with tears spilling down my face. thanks for helping me understand better how and why i share the way i do, why i enjoy watching others, and why i encourage everyone else to do the same. Wow! You’ve got her eyes! Well done Christian to both you and your Nonna – I was inspired when I heard your interview on Spark – what a fabulous idea and what a charming relationship you have with each other. You both speak so warmly that it makes one stop to listen. You have touched upon an idea that has been close to my heart. I work with older seniors everyday. I have lost so many opportunities to record and remember the many stories that I have heard. I have known that technology would be a benefit someday but I still don’t find the time to find out about these things. I would like to introduce the idea to other like minded care givers, my associates. Not many of us are technically savvy but would like to learn. I enjoyed reading other comments. 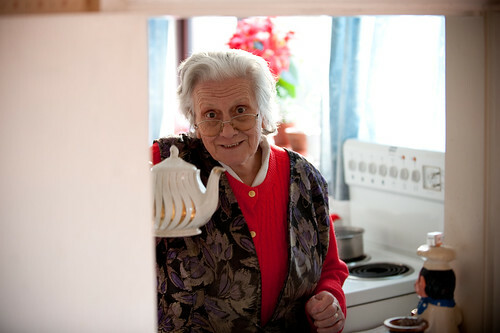 You have sparked a gentle and sensitive dialogue that includes people who are obviously touched by listening to your Nonna’s stories and point of view. The comments are respectful, sensitive and fun. Thanks again. Your nonna is wonderful, and i really enjoyed your writing and photos. It’s lovely getting a sense of personal history from loved ones, and truly touching to see the photo of your nonna when she was young. I am much younger than her, and my computer skills are a zillion times worse, I am very envious! Christian, it was simply inspiring….bet you can guess why.